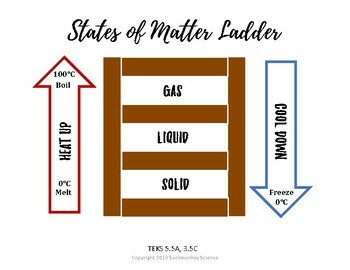 SUPPLEMENTAL VISUAL AIDS for 5th Grade Science STAAR 2019. Test Prep / Study Materials WITH KEYS: 3rd-5th Streamlined Science TEKS (Texas). Great for test review, study guide, ELL, ESL, and Special Needs. 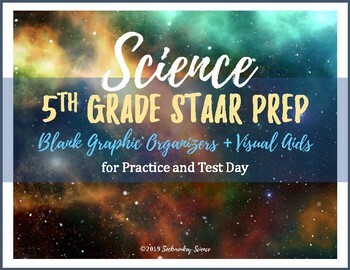 Did you know you can use visual aids, science illustrations, and blank graphic organizers as supplemental aids DURING 5TH GRADE SCIENCE STAAR testing? This HUGE COMPREHENSIVE BUNDLE includes over 75 pages of graphic materials to help your students prepare and excel on the Fifth Grade Science STAAR test. Visual aids help tremendously with student recall, and this set is also an excellent study tool for your students to take home in the weeks before STAAR. Don't forget your UGLY CHICKENS STAAR testing strategies! I created this last year for my own students when I found out the rules had changed, and updated it this year so I could make it available for you to use in your own classroom! Includes a blank color and black & white version for easier printing, as well as a color teacher key for every graphic I created! Did you know? The simple inclusion of a visual image in your lectures or presentations increases student retention from 10% to as much as 65%. 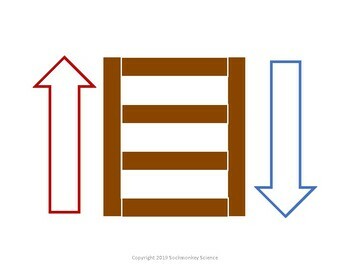 This is why all of my vocabulary resources include visual aids and color. These are perfect for ESL, ELL and special education students as well. ALL GRAPHICS ARE COMPUTER ILLUSTRATIONS. As far as I understand, photographs do not qualify as "science graphics" for supplemental aids, as outlined by TEA. These science graphics and blank graphic organizers are intended to help students prepare for the 5th grade science STAAR test in Texas. How to use this resource: In my classroom, I begin using these graphics at the beginning of the year so the students are familiar with them. Each week when we start a new unit, we fill out the corresponding science graphic organizer or illustration together. I project it, and then we discuss it. I also occasionally use it for an end of unit assessment rather than introducing it at the beginning of a unit. In the last weeks before Science STAAR, we do them all again, one per day. They take the original set they built over the school year home to study with. These are the supplemental aids I made for my own students to use during the test to help with recall. 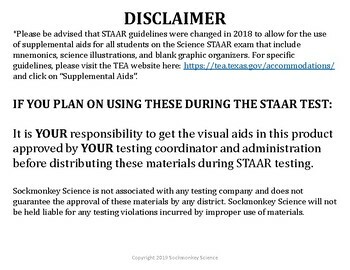 However, it is your responsibility to get supplemental aid materials approved with your testing coordinator and administration before using them during STAAR testing. Wait...there is a lot of monkey business going on all over the internetz. Come find out more about me, my classroom, and my work! Please visit my store for more projects, activities and my 6th Grade Science TEKS aligned resources, like my Vocabulary Bundles! Thank you so much for choosing my products. Please follow me on TPT! You’ll be the first to know when I post a freebie, a new product, or have an amazing sale! To follow me, go to the top right of this page where you see my logo. Click the little green star it says “Follow Me” and you’re done! Did you know that you can receive credit towards future purchases by reviewing this product? If you liked what you got, please leave a review on the product page or through “My Purchases”. If you had an issue or found an inaccuracy, PLEASE contact me at sockmonkeyscience@gmail.com prior to leaving negative feedback. I will do everything I can to ensure you are satisfied! I want all teachers who choose my products to be 100% happy with their purchase. Copyright © Sockmonkey Science. All rights reserved by author. This product is to be used by the original purchaser only. Copying for more than one teacher, classroom, department, school, or school system is prohibited. This product may not be distributed outside the school setting. Failure to comply is a copyright infringement and a violation of the Digital Millennium Copyright Act (DMCA). Clipart, content and design elements found in this PDF cannot be extracted and used outside of this file without permission or license. Intended for classroom and personal use ONLY. You can find more information in the TOU file located with the product download.